Dress up these standard 8 door CBU Mailboxes 4 parcel lockers with a touch of elegance using these USPS approved Vogue Traditional mailbox accessories kit. 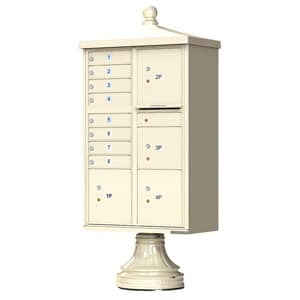 Vogue mailbox accessory kits, by Florence Manufacturing, come with everything you need for installation; 8 door cluster box unit with pedestal and decorative ball finial caps, column pedestal cover and column base. The kit offers quick and easy snap together installation using self-tapping screws (without compromising security). 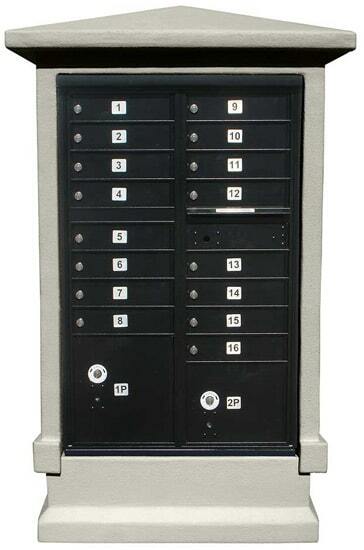 CBU roof cap with ball finial screws directly onto the top of the 8 door CBU mailboxes while the Post Column and Base wrap around the existing CBU mailbox pedestal. Decorative Vogue mailbox accessories are available in 4 matching colors by Auth Florence Manufacturing and feature a powder coat finish to protect against damage and rust. 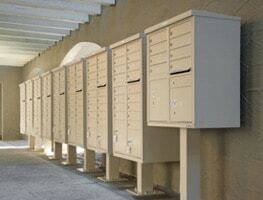 Auth Florence CBU Commercial Mailboxes are regarded as one of the most secure centralized mail delivery systems on the market. 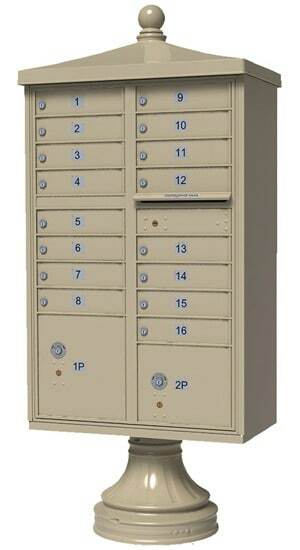 Officially licensed by the USPS, these CBU mailboxes come equipped for USPS master locks. 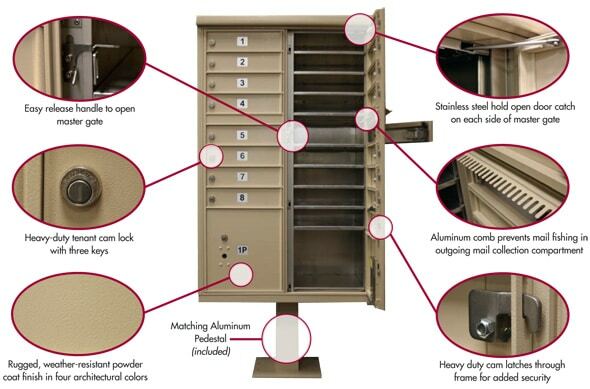 All around heavy duty extruded aluminum construction with main doors that open up to ease mail delivery by the USPS while outgoing mail is stored securely behind the master door. 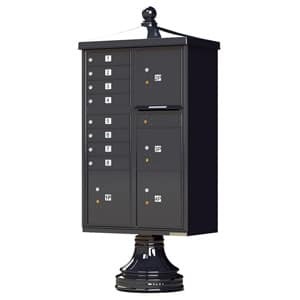 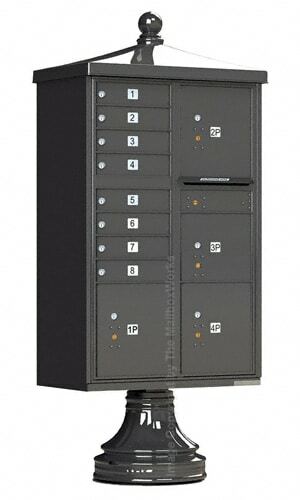 Additional security features include parcel key capture system to secure parcel locker key after tenant has removed package, 360 degree wrap around stainless steel hinges and welded seams. 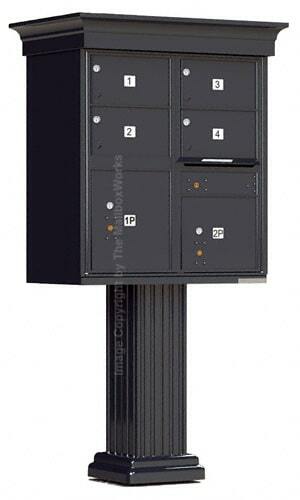 8 tenant compartments with enough room to hold oversized envelopes and small packages. 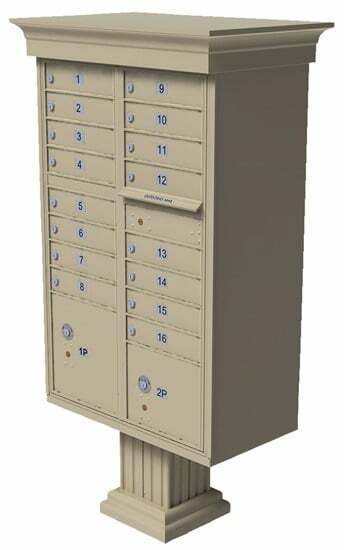 4 parcel lockers to allow tenants to receive packages too big for individual compartments plus 1 outgoing mail slot for easy and secure mail collection. 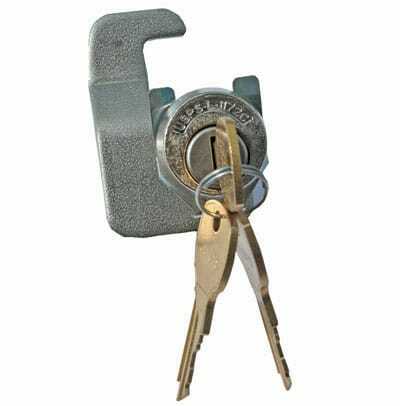 Comes with 3 keys per tenant door, each of which features a 5-pin cylinder cam lock. 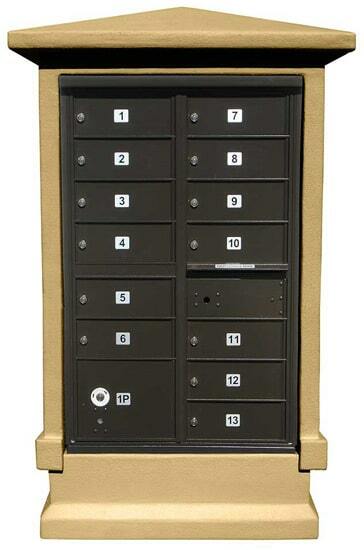 Each door also features numbered placards with optional customer engraving available, as listed in the Tenant Door Identification option to the right. 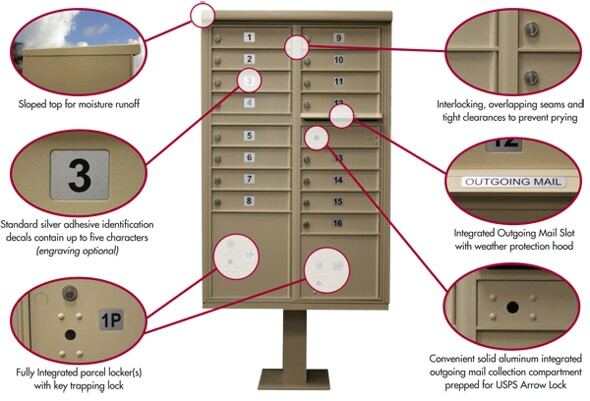 If you need more information or require help to purchase 8 Door CBU mailboxes 4 Parcel lockers with Vogue Traditional mailbox accessories, call us or chat with a customer care rep if you have any questions.